Thanks to a strong relationship, forged over two decades, Cambridge academics are helping UK aerospace leader Rolls-Royce deliver the next generation of innovative superalloys. The UK aerospace industry is the largest in Europe, with a turnover in 2011 of £24.2 billion. Increasing global air traffic is estimated to require 35,000 new passenger aircraft by 2030, worth about $4.8 trillion. 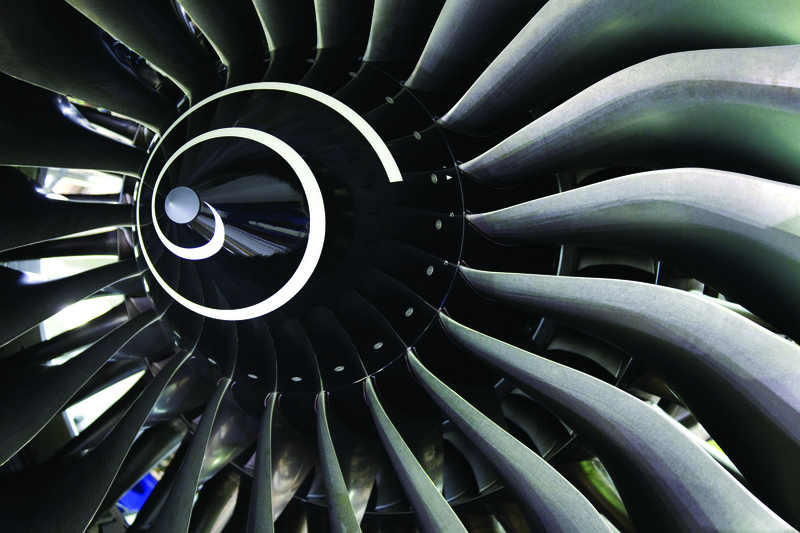 Modern jet engines are one of engineering’s most extreme environments, and scientists at Cambridge are working closely with industry leaders Rolls-Royce to deliver the next generation of innovative superalloys. Key to this work is the Rolls-Royce University Technology Centre (UTC) at Cambridge’s Department of Materials Science and Metallurgy. Founded in 1994 and part of a network of over 30 UTCs worldwide, it is part of Rolls-Royce’s £1 billion a year investment in research and development, which also includes the Department of Engineering’s University Gas Turbine Partnership. For the past two decades, Cambridge has collaborated with Rolls-Royce to link fundamental materials research with industrial application and commercial exploitation. And because the academics understand the materials and design challenges the company faces, the novel nickel and steel alloys developed at Cambridge are helping Rolls-Royce maintain its competitive advantage. The inside of a jet engine is one of the most extreme environments known to engineering. In less than a second, a tonne of air is sucked into the engine, squeezed to a fraction of its normal volume and then passed across hundreds of blades rotating at speeds of up to 10,000 rpm. Reaching the combustor, the air is mixed with kerosene and ignited; the resulting gases are about a third as hot as the sun’s surface and hurtle at speeds of almost 1,500 km per hour towards a wall of turbines, where each blade generates power equivalent to the thrust of a Formula 1 racing car. Turbine blades made from ‘super’ materials with outstanding properties are needed to withstand these unimaginably challenging conditions – where the temperatures soar to above the melting point of the turbine components and the centrifugal forces are equivalent to hanging a double-decker bus from each blade. Even with these qualities, the blades require a ceramic layer and an air cooling system to prevent them from melting when the engine reaches its top temperatures. But with ever-increasing demands for greater performance and reduced emissions, the aerospace industry needs engines to run even hotter and faster, and this means expecting more and more from the materials they are made from. Researchers in Cambridge’s Rolls-Royce UTC are rising to the challenge of designing new materials for these extreme environments. Their efforts are focused on extracting the greatest possible performance from nickel-based superalloys, and on designing superalloys of the future. Current jet engines predominantly use alloys containing nickel and aluminium. These alloys are formed of tiny metallic crystals that are arranged like bricks in a wall. To this they add up to eight other elements in different amounts to get the best combination of properties for their metal bricks and mortar. Like adjusting the ingredients in a cake, increasing one ingredient might produce a sought-after property, but at the sake of another, so the hunt is on for the perfect chemical recipe. Dr Howard Stone oversees a £50 million strategic partnership on structural metallic systems for advanced gas turbine applications funded jointly by Rolls-Royce and the Engineering and Physical Sciences Research Council (EPSRC), and involving six other UK universities. The researchers melt together precise amounts of each of the different elements to obtain a 5cm bar, then exhaustively test the bar’s mechanical properties and analyse its microscopic structure, using their experience in atomic engineering to home in on where the incremental improvements might be found. For more information, watch our film.